Jim Broadbent dons the red suit and white beard and leads a sterling British cast in this fun (but flawed) Christmas cracker. Writer/director Christopher Smith has taken the same old Santa spiel and re-worked it into something quite different and entertaining. So what’s it all about? 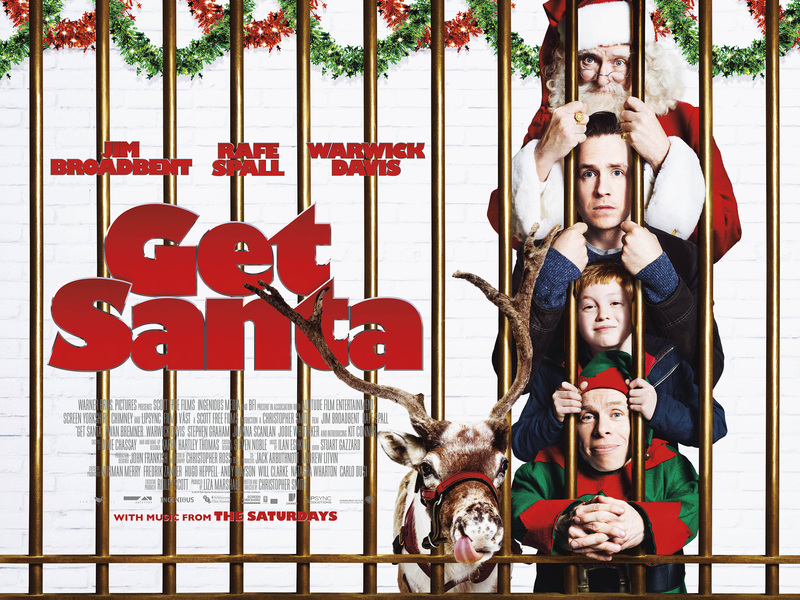 (Besides the obvious implications of the title) A father (Rafe Spall) and son (Kit Connor) team up to save Christmas after discovering Santa Claus (Broadbent) sleeping in their garage and on the run from the police. A breath of fresh air! I was surprised at how little this film was marketed at the cinemas. It’s not without it’s imperfections but I can certainly commend it’s originality. Execution on the other hand? Ho, ho, ho, here we go. Broadbent brings St Nick to life brilliantly and delivered the charm by the stocking full. He was everything I expected. Funny, endearing and entertaining. It always helps in these family holiday films to have a likeable cast. Connor (An impressive debut from the little chap) and Spall (X + Y) were fantastic together. They played the parts well and made the father/son dynamic work. Spall’s dead pan delivery certainly made for some cracking one liners. His reaction when Tom tells him he’s found SC in the garage; “Are you in the garage with a man? Pass the phone to your mum”. Priceless. The prison angle was a fresh take. Recently released from prison, Steve is desperate to be a good dad. Little does he know that his prison ties will be more important than ever. His quest for redemption certainly had a little more substance to the usual Christmas father/son squabbles. The idea of SC incarcerated was a perfect platform for some fun gags. I smiled a lot more than I expected and was surprised at the stars that popped up in this. Matt King (Super Hands from Peep Show) featured as a miserable and unsatisfied prison guard. To be honest, his character was nowhere near as good as I hoped. If anything, he was a little flat. Even the OTT comical punch up between him and Warwick Davis (Harry Potter) left little to be desired. Davis, on the other hand, was quite good. Of course, lazy elf gags galore were thrown at the poor chap but his retorts and sarcastic jibes made up for it. And what was Combo from This is England doing in this?! Stephen Graham’s turn as The Barber was an unexpected delight. Good to see he can still have a laugh and that he’s not too big for the small Brit pics. His tough guy training sesh with Broadbent was almost worth the ticket alone. I was in stitches watching ol’ SC strutting around the gaff with corn locks. Throw in a cheeky slow mo tough guy montage to a bit of Ice Cube for good measure? Yes please. Joanna Scanlan (Stella) played the delightfully unpleasant parole officer with aplomb. BUT apart from stomping about and carrying a toad in tow (You read that right), she didn’t really do much else. Jodie Whittaker (Broadchurch) was wasted in her role. Apart from a few awkward exchanges (and rightly so) between her character and Steve, she didn’t really pop back up until the final moments. The reindeer were quite funny for the little ‘uns. Especially the deceptive Dasher (who manages to break into vans without explanation). He can’t talk but he can communicate. And of course being a children’s movie, he does so by farting. That’s right. Communicating through farts (Come on, we’re better than that). Although Spall trying to remain serious as the furry critters trumped away was quite funny. Ewen Bremner (Trainspotting) was really irritating as the over-enthusiastic and deluded PC Finkerton. He did my nut in. Unfortunately, for every clever little prison gag, there were a dozen recycled ones. BUT there was still fun to be had. A cheeky Shawshank Redemption reference shouldn’t have worked but it got a little nod from me. For the little ‘uns, you have Big Nick firing a tommy gun of reindeer droppings in a high speed police chase. The animation was a little cartoony for me. Especially in the letter tunnel when Steve and Tom are transported to Lapland. BUT their sleigh ride was brilliantly captured. Santa’s gadgets were quite cool. His slinky/chimney expander was a nifty little trinket. I know it’s a Christmas film BUT it skimmed through a number of plot holes. Look, I’m prepared to except all the rubbish about SC and the reindeer flight paths (It’s a kids film after all) BUT breaking out of secure prisons so flippantly? Come on now. It wrapped things up a little too quickly. For a moment, I wondered if Smith was going to play on the “Is he/isn’t he SC?” spiel a little more as Steve fears that he’s helping a chap who is nothing more than a petty criminal. I loved its originality but was a little disappointed in its execution as it raced to its shamefully predictable, corny and rushed finale. BUT I had a lot more fun than I expected and it wasn’t the worst way to kill 90 minutes.